Sonya Hoffman plays her Hungarian style Concertino. 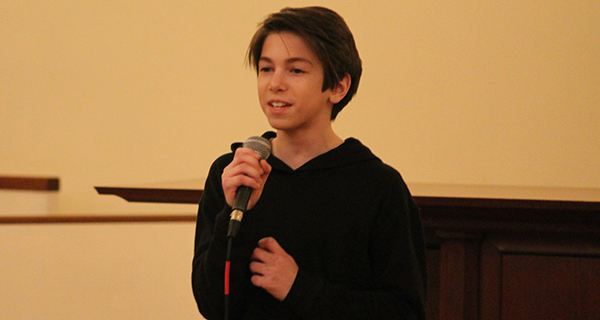 Dover’s Got Talent eventual champion Nick Mangiaratti performs an Otis Redding classic. On Friday night, St. Dunstan’s Episcopal Church held its first ever “Dover’s Got Talent” as part of their ongoing Dover Unplugged series. Because the church had never held the event before, there may have been questions as to just how much talent Dover has. The first act was more promotional than anything. A group from “The Drowsy Chaperone” acknowledged they wouldn’t win the evening’s grand prize because, compared to kid performers, “we’re not cute enough to get your votes.” Dressed as chefs, gangsters and a blonde-wigged femme fatale, the four performed “Toledo Surprise.” While they didn’t expect to win, they hoped their performance would bring people to the show, which runs from May 2-5 at the Mudge Auditorium - and one audience member even won a free ticket to the show in a raffle. When they were done, the real competition began. First up was nine-year-old Caroline Johnson, who sang Pink’s “A Million Dreams” from ”The Greatest Showman” soundtrack. Johnson laughed off an initial stumble over the lyrics to give a rousing performance that had the initially timid crowd extremely excited for the rest of the event. She was followed by Sonya Hoffman, a violinist who has been playing the stringed instrument since she was five years old. Hoffman performed a Violin Concertino in Hungarian Style (Rieding, Oskar), performed in A minor. Hoffman’s talent was extremely evident - a girl her age performing such a piece is absurdly impressive. But while her talent was undeniable, her musical selection may have gone over the heads of a crowd that was not as well-versed in classical music. Another musician was Aaron Corrigan, a piano player who played “Malaguena.” Corrigan’s piece was tremendous, but incredibly quick - so much so that the crowd may not have had time to process how thoroughly good it was. The only non-musical piece was an Irish step dance performance from Alice McGowan. 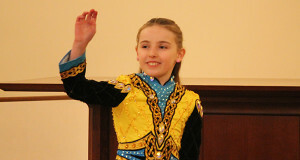 McGowan’s music came from the emcee’s phone, but her performance was impressive enough that it had kids both moving up to the stage and standing on top of the church pews to see her better. The final act was the eventual winner, singer/songwriter Nick Mangiaratti, who covered “Sitting on the Dock of the Bay” by Otis Redding. While many of the acts had friends and family present, Mangiaratti had a gang of boys that occupied two entire pews of the church, and loudly chanted his name before he began. While they wanted to hear “New York Style,” a Mangiaratti original, they were more than happy with their friend’s performance. When the crowd’s ballots were collected, Mangiaratti was named the winner. Second place went to Sonya Hoffman, and third place went to Alice McGowan. While Mangiaratti had the most fans present, they were not numerous enough to account for the victory. Mangiaratti was a worthy winner and showed what a class act he was soon after being named as such. Alice McGowan acknowledges a fan in the crowd. When he won the first ever “Dover’s Got Talent,” Nick Mangiaratti sang in front of a large group of his fans. With a top-notch performance and a classy move soon after, Mangiaratti left St. Dunstan’s Church with many more.